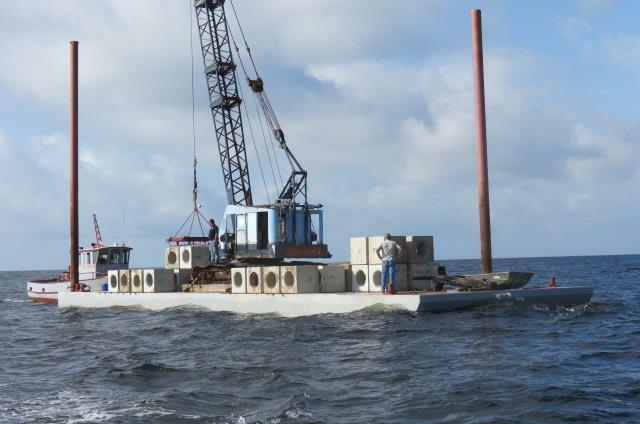 During this past summer and fall, Taylor County deployed 2 new artificial reefs on the permitted Buckeye Reef site. This site is approximately 26 nautical miles off Keaton Beach. The first reef deployment consisted of 120 constructed concrete cubes. The cubes were placed in patches of 4 cubes per patch, for a total of 30 patch reefs. The center coordinates for this deployment are 29o 38.879 North, and 83o 54.767 West. The additional patch reefs were spaced at approximately 200 feet between each patch, in a cross pattern. The cubes extend out North and South, and East and West from the center coordinates. The second deployment consisted of concrete culvert pipe and concrete material, donated by the local Florida Department of Transportation. Total weight of this deployment was 75 tons. The coordinates for this reef is 29o 38.441 North, and 83o 54.748 West. Taylor County Reef and Research Team member Jody Courtney and Geoff Wallat oversaw the deployment of the reef materials.